The Fable fine pearl bracelet is a contemporary and modern piece of bridal jewellery, telling a tale of feminine beauty and timeless elegance. Designed for the contemporary bride, the scattered details on this bracelet evoke a modern simplicity. The Fable bracelet features intriguing yet minimal crystal details, creating a subtle edgy vibe for non-traditional brides. The Fable bridal bracelet is made to order. Please allow 2-3 weeks for production plus delivery times. The Fable is a modern and understated bridal bracelet that complements our collection of bridal accessories and veils. We love to style this dainty piece with delicate hair pieces and pins to bolder and ornate headpieces. Our favourite headpieces to style with Fable include the Rosebury, Blanchett and Tempest crowns, and the Somerset, Juliet, Giselle, Wild Willows and Aries combs – just to name a few. Sometimes a bridal look calls for something delicate and refined, and we think the Fable is the perfect finishing touch. 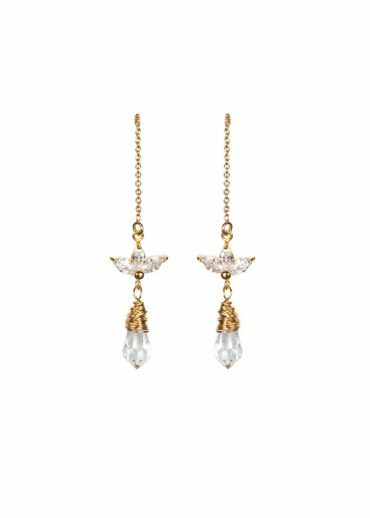 For added glamour, pair it with the Isabeau, Arlette or George crystal earrings.